"I wanna send vibrations of strength. Strength, sensibility and fury"
Lily is elegant and has an exquisite aesthetic sense in all her compositions. From the beginning, after knowing that we’re going to open a restaurant in Lleida, we’re clear that we had to contact her to make a mural. For what her art represents and for our admiration to his balanced compositions. In fact, when discussing it with our friends from the street art world, they all cited her name. For these reasons, we reserve the largest and most visible wall in Bacoa Lleida. Well, actually I’ve never really been into street art until I realised how free you are when you express your art in the streets. About 4 years ago I met these guys from Lleida who came together to paint in the Segre river and they kindly offered me a spot to paint in the wall. That’s where I popped my cherry. I never pictured myself with an aerosol spray paint in my hand and a blank wall in front of me, but that’s all I do lately. From that day, I haven’t stopped the learning process and I’m growing every day. I gotta say, I’m hooked on street art. Probably what I used to do: corporate branding designs, clothes, product content, supervising and producing printing methods… Which I could never do now, once you work on something you love there’s no turning back. I’d say that the main struggle I’ve faced is changing my mindset, from a regular life default mode to living and breathing art. In my day to day life, I face challenges of all kinds and sizes cause this is a tough craft. Even after all these wall paintings I’m constantly making mistakes and learning from them. 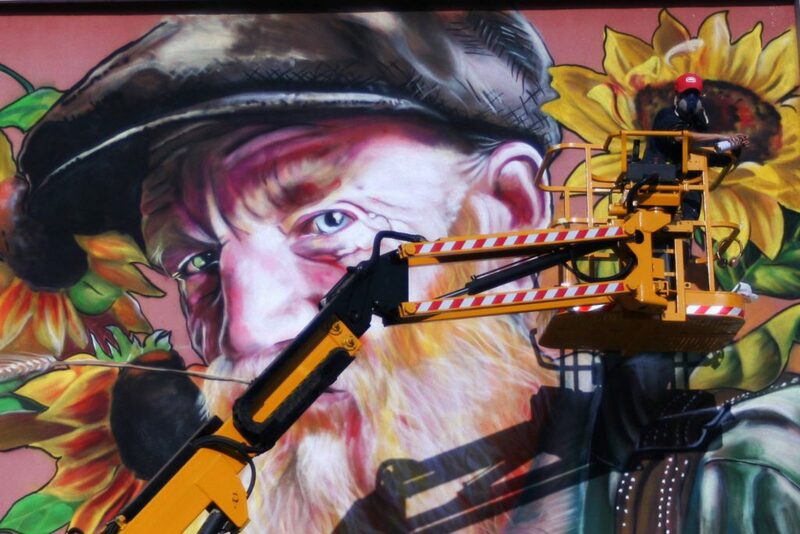 The way I see it, that’s the beauty of it, painting a wall on its own, it’s a huge challenge. What about the biggest, literally, in size? The biggest one it still is a 500 meters wall I painted in Alcarràs. It illustrates the whole process of fruit collecting, the family’s background, showing from the most bucolic aspect of it to the most industrial one. It really is a magnificent piece, it took me three months to finish it. I’d like to mention how the street art scene now is growing on a global scale. It’s a highly praised craft now, even considered necessary in some cultures. Well, I want everyone to acknowledge how the beautiful city of Lleida could get much deeper into urban art, giving that way a little color to all of those grey walls that we find along the way. There are some real geniuses out there who could paint some true beauty in and out of this city. From my experience, street art always adds a positive value. Being from Lleida, I’d really like to come across beautiful walls more often within the city. Instead of how I usually do it, I couldn’t see the surroundings before working on it, so I just pictured a pretty packed place, and warm. It had to be good looking but without being intrusive, I didn’t want to mess with the momentum of calmly eating a burger. So I went for a blend of my great love for classicism, the beauty, and peace that come to mind whenever I see the silk and the fabrics in Vermeer’s paintings and the subtleness of his strokes when he painted. I work around a couple of main elements so I don’t overwhelm the viewer with a visual info overdose. I went for pastel tones, extra soft and gentle to the eye. The birds and other natural motifs are there to represent Bacoa’s eco-friendliness. That’s illustrated through the hand caressing the leave while holding the burger, or the girl eating the burger in between the flowers like it was a fruit of nature. My aim is to blend Bacoa in a delicate locus amoenus, a certain art nouveau style which really goes well with that naturism and organic theme. Women are a very present figure in your pieces. A statement or just pure inspiration? Both of them. I take great inspiration in us women, in our complex way of being, which I adore. I think the beauty of a woman’s body is something truly special and perceivable to the eyes of every living being, not just on an aesthetic level, but chiefly because of its power and endless possibilities (sometimes without being aware of them). I like to represent natural and independent woman for the plain fact that you don’t get to see many of them out there. I wanna send vibrations of strength. Strength, sensibility, and fury hidden behind every symbol and figure, who are there to help the viewer reflect into my message. What are your main sources of inspiration in and out of the field? I’m a newbie in this big art world. When I say art, I’m talking about modernist architecture, old Japanese Calligraphy and It’s oldest discipline called Sumie. I get inspiration from everything, I’m very receptive to any stimulus which can help me communicate what I feel. Recently I visited the museum of great dutch female artists in Deen Hag, from all the beauty in there I took the light with me. I have no formal education in arts, this is why being self-taught, I have to be constantly very aware and learn from my curiosity. I have to process al the artistic stimulus that come my way. I wouldn’t really know how to define my art but I’m really trying to make visual poetry, stir whatever is inside of you and get a real feeling from it. What advice would you give to anyone out there who wants to follow your steps? Be patient, have a great curiosity and don’t get sucked in your comfort zone, not even for one day, only perseverance and determination will get you to where you want to be. To me, now, all of this comes natural, but keep in mind you have to grow every day and reinvent yourself to make a living out of street art.